I’m thankful for the opportunity to review this book before the official release. Kathryn O’Sullivan brings us mysteries with a new flair but true to the tradition of Agatha Christie – great plots with engaging dialog. Firefighting Chief Collen McCabe shows how well a woman performs in positions of authority and leadership. Chief McCabe not only fights fire but crime as well and still finds time to nurture a budding romance. The story begins with the author, Kathryn O’Sullivan, breathing life into a piece of plastic sheeting from a construction site. The plastic carries the reader into the story in a kind of ballet as the sheeting takes us to a long buried crime scene. The body found is just the start of the mystery that Colleen and her friend, Sheriff Bill Dorman, work to solve as the story unfolds. There’s drama in the North Carolina’s Outer Banks community between those that support the Wild horse habitat and the piping plover shore birds as well as those that would see all habitat taken up with new construction. Colleen has a fight with Denny Custis, a ruthless land developer about these subject not long before he turns up dead at one of Chief McCabe’s fire scenes. There’s too many that have issues with Denny and the battle over land for wild habitat versus resorts to make solving the case easy but Colleen has a hunch that the long buried body and Denny’s death are connected now all she has to find out is how. Chief McCabe shows how capable a woman is when making life and death decisions without hesitation. I hope strong women both young and old read the Colleen McCabe Series as an inspiration to aspire to the jobs that are in their heart to pursue. 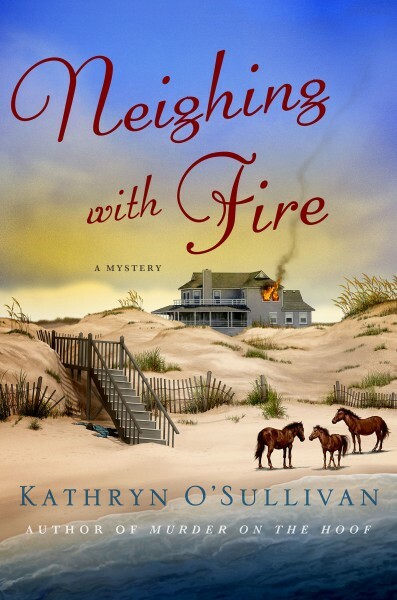 Another great part of the story is the beautifully written scene depicting the picturesque setting of the Outer Banks Village of Corolla, where wild horses still roam free and fire fighters enforce no feeding laws as well as putting out engine fires for cars unfamiliar with driving on Carova Beach. The message I take from the Colleen McCabe Series is follow your dreams, listen to the message of inner truth and strive to be the best you can be. I’m looking forward to reading more books from the Colleen McCabe Series. I enjoy mysteries that have a message similar to the one underlying Elizabeth Peters work, highlighting Amelia Peabody’s* books, women don’t need a man to succeed they just need to believe in themselves. These books are also very well written with emphasis on the mystery. I’m hopeful the writing of Kathryn O’Sullivan continues with many more rewarding reading experiences.